What Does Bruce Springsteen's 'Born In The U.S.A.' Really Mean? It's not enough to say the Bruce Springsteen hit is misunderstood. Its contrasts — between grim verses and a joyous chorus, damning facts and fierce pride — are what give it its anthemic power. Bruce Springsteen onstage during the Born in the U.S.A. Tour in 1984. If you're listening closely, the lyrics of "Born in the U.S.A." make its subject pretty clear: The 1984 hit by Bruce Springsteen describes a Vietnam War veteran who returns home to desperate circumstances and few options. Listen only to its surging refrain, though, and you could mistake it for an uncomplicated celebration of patriotism. You wouldn't be the only one. NPR's American Anthem series is about songs that Americans embrace in ways that reveal who we are — and of these songs, "Born in the U.S.A." may hold the title for the most historically misunderstood. But as NPR Music director Lauren Onkey explained to Morning Edition, it took time for Springsteen himself to figure out just what the song was meant to say. "He did a big benefit in the summer of '81 for Vietnam veterans in Los Angeles and met with vets," Onkey says. "After that tour ends, there's a number of places where he's trying to write about the Vietnam veteran experience, so the song grows out of that moment. And it starts out as something just called 'Vietnam.' "
The songwriter kept that scene as he set about writing a more haunting, but still muted version — which is where he first added the "Born in the U.S.A." refrain. In its story of one American, Onkey says, she hears the story of many. "He says, 'I'm 10 years burning down the road / Nowhere to run, ain't got nowhere to go.' Those lines, I think, describe so many of Springsteen's male characters — who are lost, who can't find a home. The systems around them of jobs and connection are unattainable." But it still wasn't the song we know. In the version that became the title track on his 1984 smash album, Springsteen made one more change: turning up the volume and shouting out the lyrics almost as if for joy. Rarely has a man with nowhere to go sounded so triumphant. As the musician later told WHYY's Fresh Air, he meant it that way. "The pride was in the chorus," Springsteen said to host Terry Gross in a 2005 interview. "In my songs, the spiritual part, the hope part, is in the choruses. The blues and your daily realities are in the details of the verses." Springsteen fans will tell you the effect that big chorus had on crowds, whether or not the message of the verses was entirely understood. Take Chris Christie — yes, that one — who saw Springsteen at New Jersey's Giants Stadium decades before he became governor of that state. "Bruce started every show with a really rousing, anthemic-type version of 'Born in the U.S.A.,' " Christie recalls. "With a bandanna on and a cutoff shirt and the fist-pumping, it felt like a celebration of being born in the USA — when really, it's a defiant song about 'I was born in the USA, and I deserve better than what I'm getting.' I think plenty of people didn't get what it was about, including the president of the United States." That would be President Ronald Reagan, who referenced The Boss in a 1984 campaign speech, saying: "America's future rests in a thousand dreams inside your hearts. 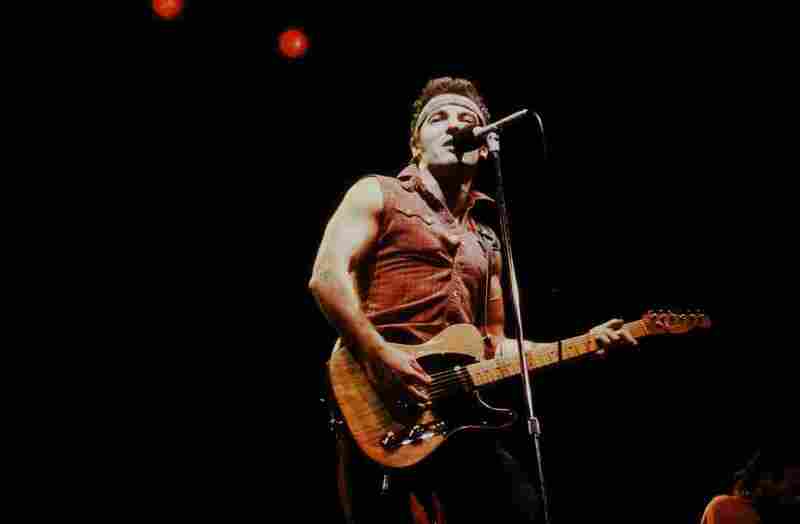 It rests in the message of hope in songs of a man so many young Americans admire, New Jersey's own Bruce Springsteen. And helping you make those dreams come true is what this job of mine is all about." By playing on the hope, Reagan seemed to overlook the despair. He may have been influenced by a sometime adviser: The columnist George F. Will, noted for his bow ties and conservative politics, tells NPR he saw Springsteen in concert that year. "Max Weinberg, of whom I'd never heard, who was the drummer for the E Street Band, of which I'd never heard, called me up out of the blue and said who he worked for and would I like to come see The Boss sing," Will says. "I thought, 'This is a way to impress my children,' and I said yes." After the show, Will penned a column praising the hardworking musicians onstage, albeit in political terms. "If all Americans — in labor and management, who make steel or cars or shoes or textiles — made their products with as much energy and confidence as Springsteen and his merry band make music, there would be no need for Congress to be thinking about protectionism," he wrote. Springsteen's politics leaned well left of Reagan's. After the president praised him, the artist mused that if people misunderstood his music, that was fine — it only made him more popular. "After it came out, I read all over the place that nobody knew what it was about," he said before performing "Born in the U.S.A" to a crowd in 1995. "I'm sure that everybody here tonight understood it. If not — if there were any misunderstandings out there — my mother thanks you, my father thanks you and my children thank you, because I've learned that that's where the money is." After the applause and laughter died down, he added: "But the songwriter always gets another shot to get it right." Over the years, Springsteen himself has been willing to tweak the song's meaning. Christie heard him play an acoustic version in the 1990s. "Much different feeling, much different sound," Christie says. "I can remember, at the show I went to see at the State Theatre in New Brunswick, N.J., a couple of people started to try to sing with him. And he stopped in midsong and said, 'I can handle this myself.' "
At other times, Springsteen dropped the upbeat chorus — singing only the verses, forcing his audience to hear the dark story of the veteran. When the U.S. invasion of Iraq loomed in 2003, he told his audience the song was a prayer for peace. Onkey says the complexity of "Born in the U.S.A." is why it endures: "It describes the ambiguities and challenges of the country that I have grown up in. And for me, it's a rock-and-roll anthem: This singer, this scream, the sound of the guitar and the scale of the song suggest that rock and roll is big enough and important enough to tell that story." Maybe the meaning of "Born in the U.S.A." is the distance between the grim verses and the joyous chorus. It's the space between frustrating facts and fierce pride — the demand to push American reality a bit closer to our ideals.